Fangirls, we all know how I feel about Disney and Pixar. They’re my OTP, my faves and baes, the queen and king. I love them so much. So of course I knew I would be going to see the Good Dinosaur as soon as I could. So, the night it came out, my friend and I went to see it after work. I told her that I knew I would be crying by the end of it, so it was likely that she would tear up at some point. And oh boy, did we. 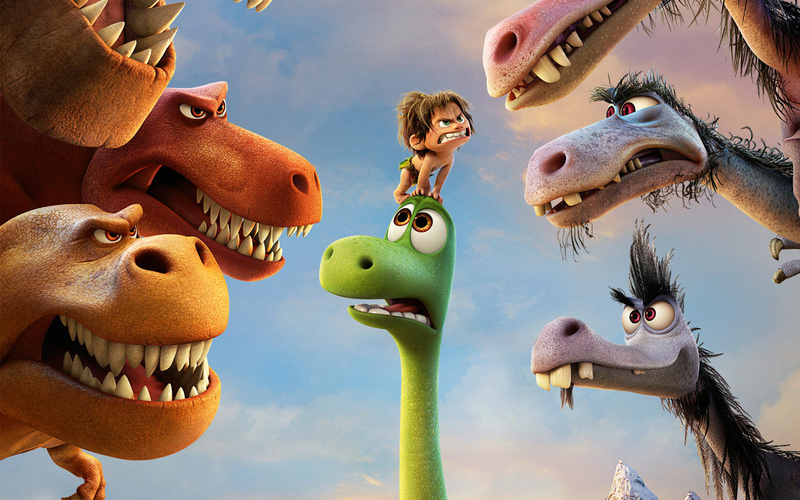 The Good Dinosaur is about Arlo, a dinosaur who is scared of just about everything. He is separated from his family when he falls into a river, and has to find his way back. He blames his being lost on Spot, an early human child, whose family is gone too. It’s very sad, but also so beautiful and important. The entire movie is about Arlo getting past his fears, and it really struck a chord with me. I have a very serious phobia, that I find it incredibly difficult to get past, and I have a fear of driving. I have been working through the driving fear; I got my permit last month on my birthday, and am trying to be less anxious behind the wheel. Arlo inspires me to keep at it, though. My favorite part of the movie is when his father takes him to a huge, foggy field, and tells him to run around. Argo is nervous, but when his dad shows him that the field is full of fireflies, and beautiful, Arlo joins him. His father says, “sometimes you have to get past the fear to see the beauty on the other side.” That’s wonderful. 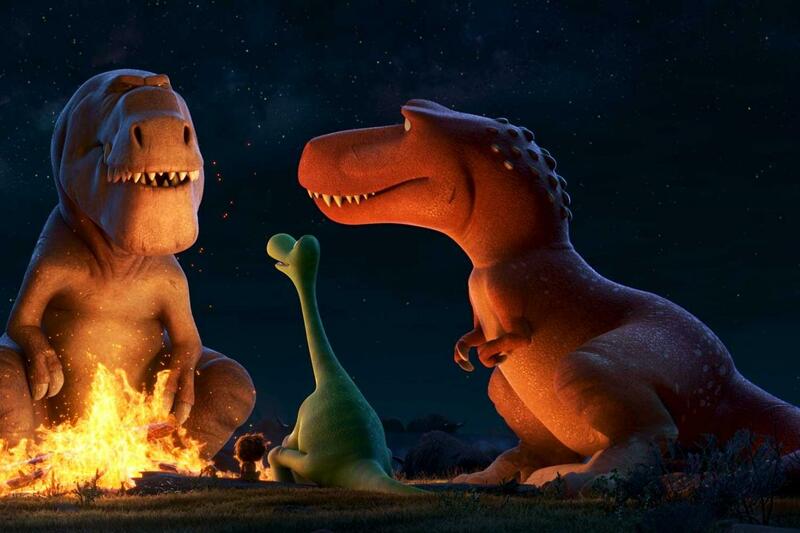 The movie is an adventure, Arlo trying to get back home, but meeting other, scary dinosaurs, that he has to talk to and fight. My favorite of which, is Ramsey. Ramsey is a very happy looking, dog-like Tyrannosaurus Rex. She, and her family, are ranchers, and they have Arlo help them to track down their stolen herd, and distract the dinos that stole them. She is just the cutest, most encouraging lady ever, and I love her. Ramsey is the red lady, sitting next to Arlo. Above all, this movie is gorgeous. The animation is so pristine and clear that it looks like the only part of the movie that’s animated is the dinosaurs; everything else looks like real video. I can not get over how beautiful it was, and I plan on taking my boy to see it next week. 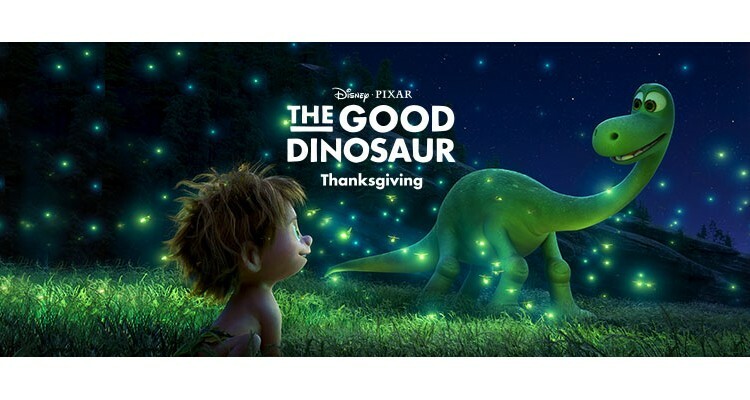 If you’re in need of a movie that isn’t Star Wars this holiday season (in reality you should see both this and Star Wars, come on), you should go see The Good Dinosaur. It’s beautiful and great for the whole family.